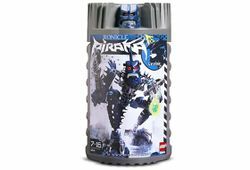 8902 Vezok is a BIONICLE set released in early 2006. It includes a model of the blue Piraka known as Vezok. Vezok once worked with Hakann to steal a Matoran Tablet. After getting it, a Dark Hunter called Ancient appeared and took it from them. Later on he and Hakann joined the Dark Hunters. Eventually, the 6 Piraka, led by Zaktan, attempted to defeat The Shadowed One. They lost and fled the island. On their way to Voya Nui, in an attempt to find the Mask of Life, they went to the lair of Makuta Teridax in Metru Nui. They were chased off by the Mana Ko, but afterwards Hakann found the Spear of Fusion. He used it on Vezok and split him into two - himself and Vezon, who then left to get the Mask of Life before the other Piraka. This is a description taken from LEGO.com. Please do not modify it. (see an archive of the product's page) Beware Vezok's fury! Nasty and vicious, Vezok's fury is always on the verge of exploding. In battle, he relies on a harpoon that pulls him through the water and a buzzsaw that hurls water daggers. His powerful impact vision and ability to absorb the powers of his enemies makes him a devastating opponent. Vezok is also known as "The Beast." Vezok's species are known Skakdi.